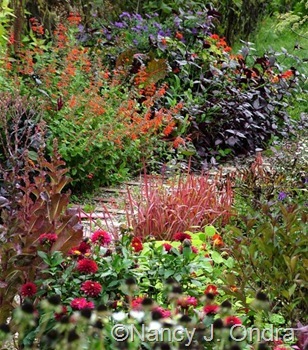 Three cheers to Rebecca of In the Garden for coming up with a great way to beat the winter blues: a “rainbow challenge.” Her suggestion was for us to post pictures of flowers in all colors of the rainbow in one post. I’m taking a slightly different angle: a series of posts, each focusing on one color. I’ve been thinking about a red post for a while, so it seemed like the perfect place to start. 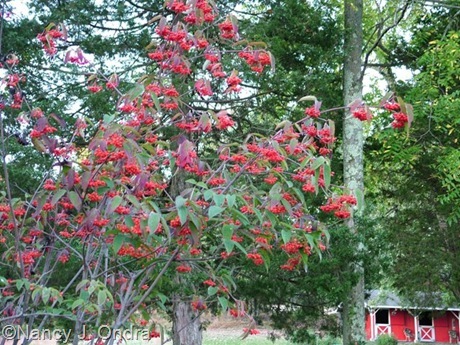 Here are some of my favorite images, starting with an early October shot from my front garden. 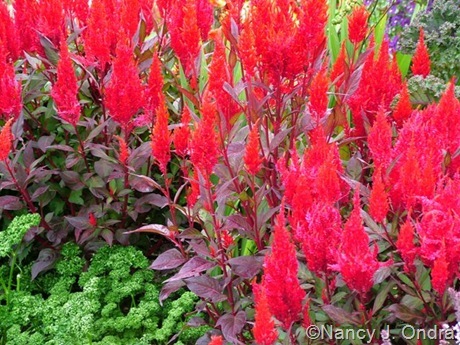 For traffic-stopping red, you simply can’t beat ‘China Town’ celosia. A little of this goes a long way! 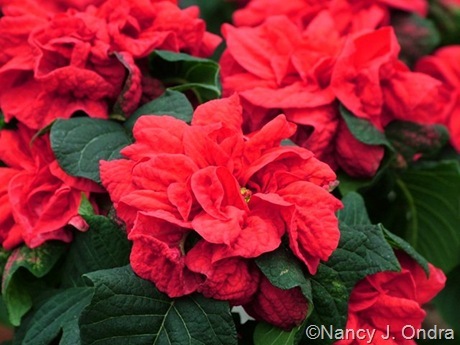 Poinsettias can be a welcome source of color during the winter months. I’m not crazy about them in general, but something about ‘Winter Rose Red’ caught my eye this year. The form’s a little…um…poofy, but well, the vivid color against the extra-dark foliage sure is nice. For summer and fall reds, zinnias are fantastic. 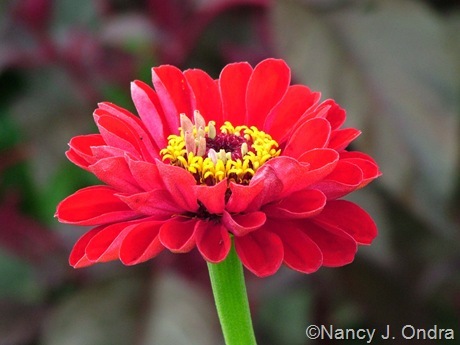 Above is a red Zinnia elegans from the “Hot Crayon Colors” collection from Renee’s Garden. 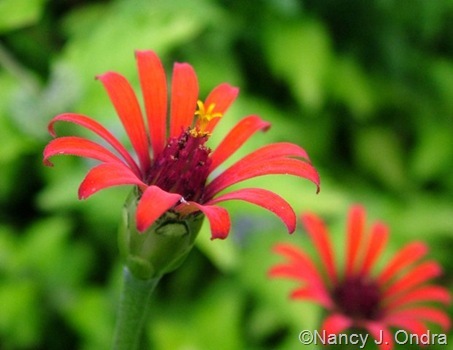 The blooms of Zinnia tenuifolia, which is usually available under the name ‘Red Spider’, are more orangey red when new, turning brick red as they age. 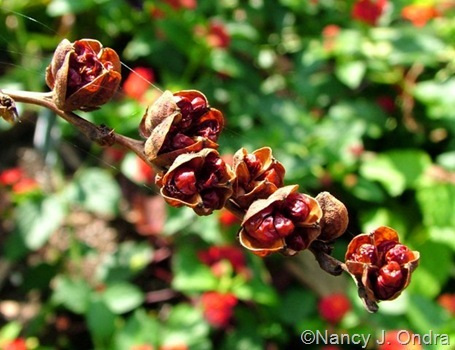 Castor beans (Ricinus communis), such as ‘Carmencita Red’ (above), are another of my favorite annuals for good reds, especially from the seedpods. 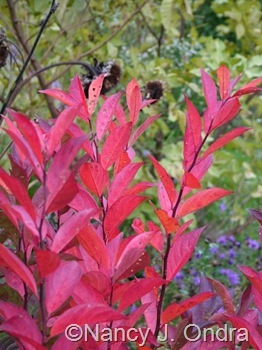 …and the variegated form of scarlet sage known as ‘Dancing Flames’, mingling above with Alternanthera ‘Purple Knight’. 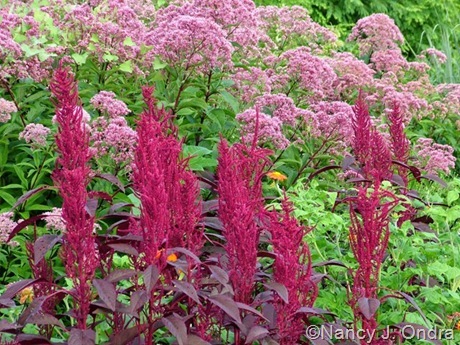 …and ‘Hopi Red Dye’ amaranth (Amaranthus), paired above with Joe-Pye weed (Eupatorium pupureum). 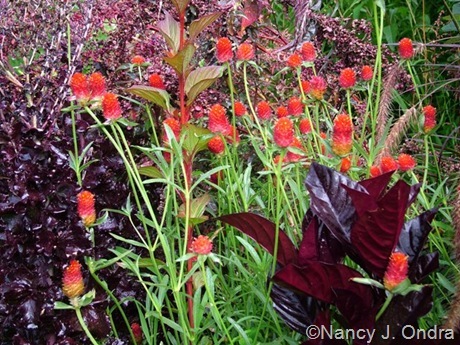 For bright spots of color, there’s ‘Strawberry Fields’ globe amaranth (Gomphrena haageana), here with Pseuderanthemum atropurpureum ‘Rubrum’ and ‘Merlot’ lettuce. The individual blooms of tassel flower (Emilia javanica) are actually quite small, but they pack quite a punch color-wise. 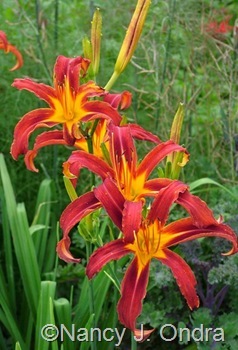 When it comes to crocosmias, I love the height, arching sprays, and rich red of ‘Lucifer’, but the much shorter and more orangey red ‘Emberglow’ is cute too. Two months later, ‘Emberglow’ is evident only as low, grassy foliage, but blood grass (Imperata cylindrica ‘Red Baron’) just keeps getting better, and ‘Bishop of Llandaff’ dahlia is full of flowers as the temperatures cool off a bit. 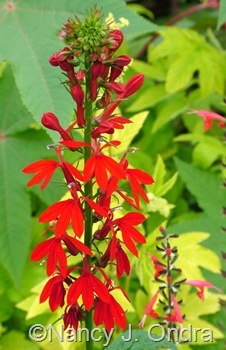 …and of course, cardinal flower (Lobelia cardinalis). 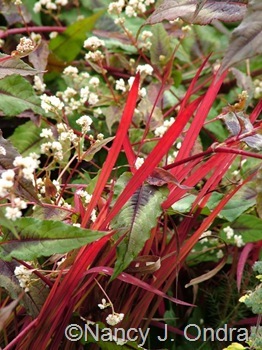 …and so is blood grass (Imperata cylindrica ‘Red Baron’), especially in autumn. 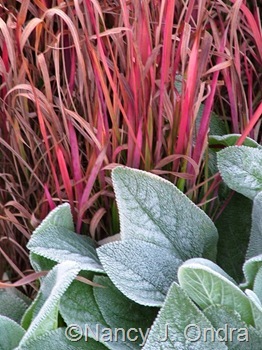 Above, it’s with ‘Red Dragon’ fleeceflower (Persicaria microcephala); below, it’s with ‘Big Ears’ lamb’s ears (Stachys byzantina). 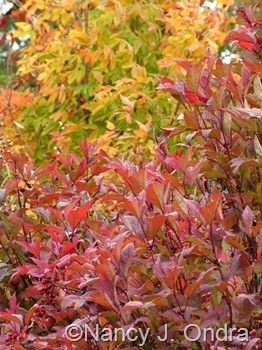 And ‘Bailey’s Compact’ viburnum, shown against Acer triflorum above. 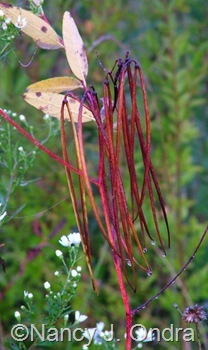 By definition, red-twig dogwoods (Cornus sericea) have red stems, but they’re not all created equal. 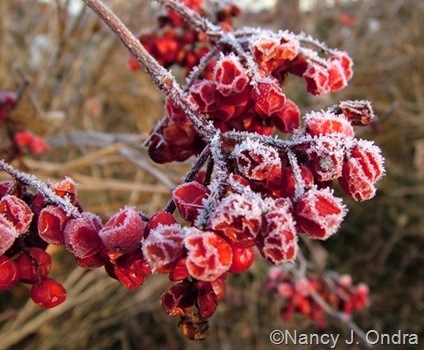 ‘Cardinal’ is one of the best: a glowing winter red even when encased in ice. 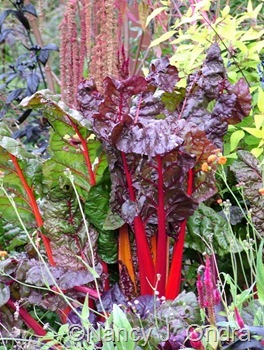 For summer color, chards (these are from the ‘Bright Lights’ mix) are superb. Hemp dogbane (Apocynum cannabinum) out in the meadow. The summer seedpods of Diabolo ninebark (Physocarpus opulifolius ‘Monlo’). 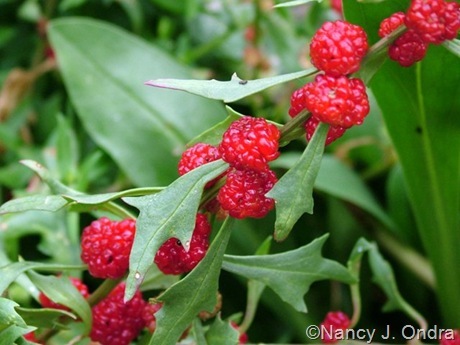 The edible but very seedy fruits of strawberry blite (Chenopodium capitatum). ‘Black Pearl’ pepper (Capsicum annuum) ripe fruits, with ‘Australian Yellow’ lettuce. 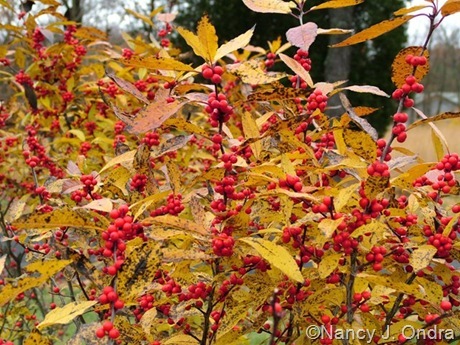 ‘Winter Red’ winterberry (Ilex verticillata). 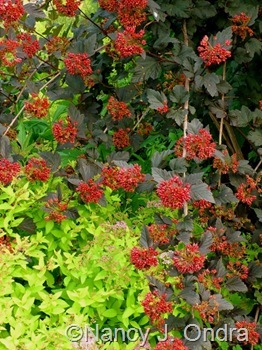 And last, the berries of ‘Red Wing’ viburnum (V. trilobum). Huh, we ended back with a frosty winter scene. Well, the warmth was nice while it lasted. I’m looking forward to orange too, Kim. There won’t be nearly as many photos, though; I have a lot more reds than I thought. They’re my favorite part of the front garden. 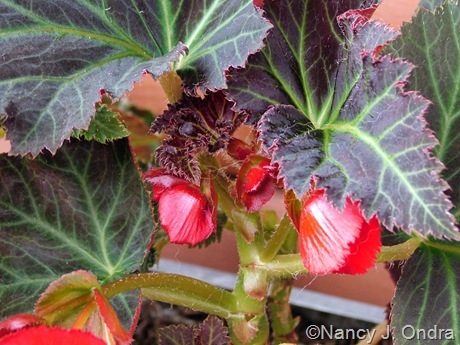 Nan, all I can say is “WOW” – what a variety you have in your garden, and thank you so much for always sharing both images and useful information. Hi Lene! I’m so grateful to Rebecca for giving us a great excuse to rifle through our photo archives and roll around in some much-needed color. My goodness Nan. You have taken red to a new level. Actually several different levels. Marvelous way to tell myself that it is really warm outside. Not. Oh, Lisa, it is SO not warm it’s not funny. 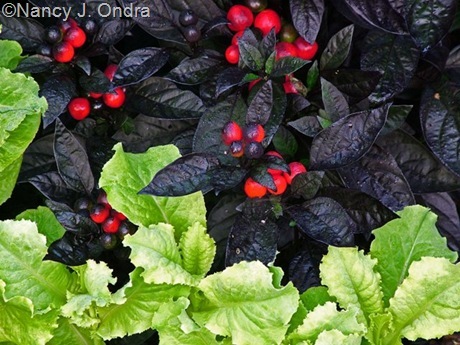 Thank goodness for our virtual gardens, huh? Heh – you mean that you knew I couldn’t show enough self-restraint to follow the rules! I did cut this one down, but I should have put a “long post!” warning at the top. So many lovely shades of red! I love the red zinnias. They make me long for summer! Me too, Robin! I just splurged on a bunch of zinnia seeds in anticipation of lots of summer bouquets. 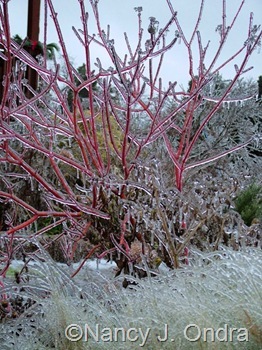 Your reds are so cheering while we are surrounded by ice and snow here in TN, Nan. Lots of ideas of combos, as always. 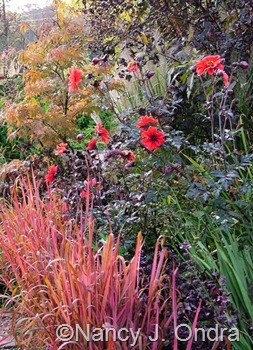 The blood grass and nasturtium will be copied blantantly here. 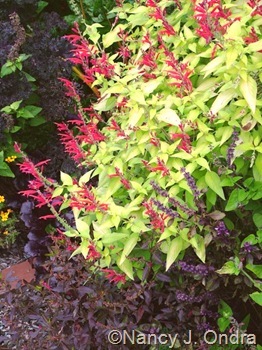 Glad to see you have the golden leaf pineapple sage too, we took cuttings since it is so difficult to find here. I wish I could overwinter the sage here, but my house is too cold, I guess. Fortunately, I have pretty good luck finding it up here. The nasturtium, however, IS becoming a challenge. I used to be able to get it from Territorial Seed, but they dropped it this year. I found it from a few small places through Google. It’s definitely worth hunting for! You continue to feed my plant lust. 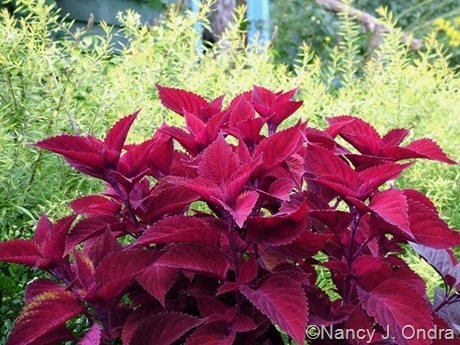 The Red Ruby coleus, ‘China Town’ celosia and cardinal flower have been added to my “To Buy” plant list. Thank you (I think). You’re welcome, Marie! Always glad to enable a fellow gardener. Mmm, such a treat for the eyes! 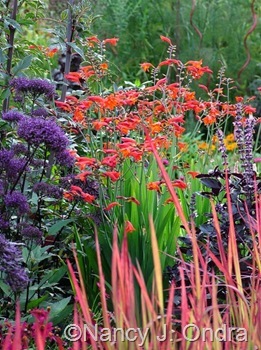 Although I love all the beautiful red plants you showed, I think what I like best is the way you’ve combined them with other plants. You really are a master at that! I appreciate your comment, Jean. Finding ways to show these beauties off to best advantage is one of my favorite parts of gardening! 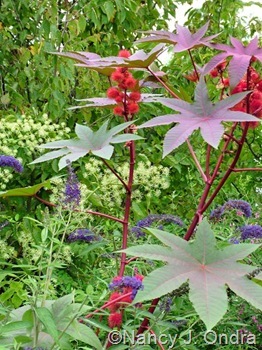 These are perfect examples of amazing combinations that inspire gardeners, and for every season! Sidebar – The use of red can be so intimidating because it is easy to end up with a red that is too pink to work with other reds; or a blue”that reads as purple; or a yellow that is gold. 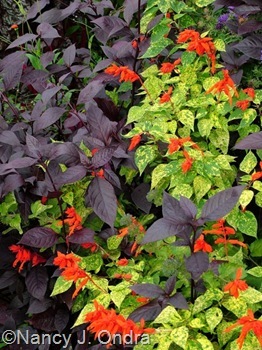 Which gets me to my point… I wish all plant sellers would adopt a standard to describe colors, such as the RHS color codes. You’re so right about the pink-reds versus the blue-reds; there can be a big difference in the right companions. I’ve tried using the RHS system, but I find that the color chip matches can vary a good bit depending on the light and the age of the flower. Plus, the set costs a lot (not sure what it is now, but I remember considering it a big expense 20 years ago). Still, you make a good point about needing a standard. What a fun challenge, I am am also going to take it up. 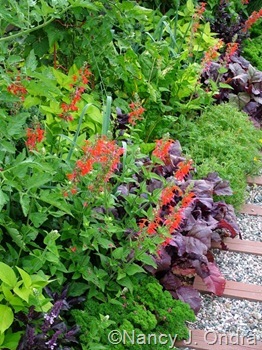 What a huge variety of reds you have in your garden (that’s also my favorite flower and foliage/berry color). 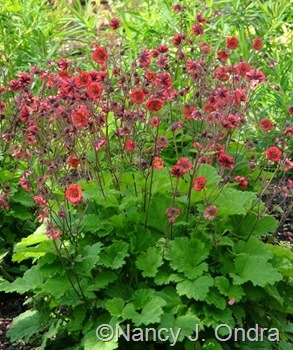 When I was a child tassel flower grew as a weed (in red and purple) I have always liked it, thanks for the ID, for now I can purchase the seeds. 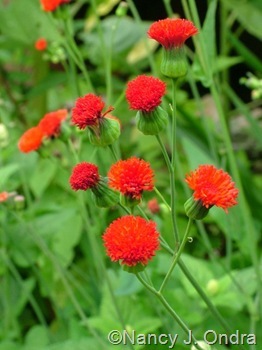 That’s great about the tassel flower. I’ve never seen it in purple – just orange and red; I’ll have to check it out. All that red was just the thing to warm up this cold, January day. Red hot! Anything warming is definitely in order these days. I imagine you’re even colder than we are. Hurry, spring! 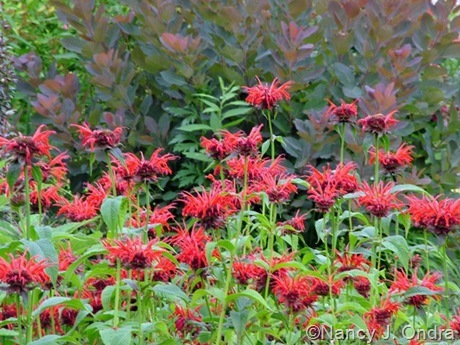 Red is such an eye-catching color in the garden, and you’ve got it in all shades, shapes and sizes! I really enjoy seeing the different hues, from the pinky ones to orangish ones to straight-up fire engine red. Thanks for stopping by, Rose. I’m not surprised to hear that you’re fond of the reds! Isn’t this a fun idea? Don’t forget to check out the others too on Rebecca’s site. I need to get back there and leave my own link. 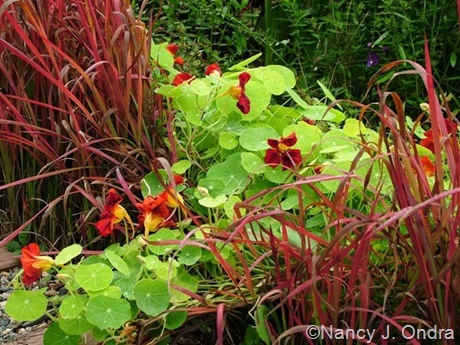 Be still my heart – I have to have that ‘Tip Top Mahogany’ Nasturtium! And ‘Black Prince’ Snapdragons! And Capsicum ‘Black Pearl’! 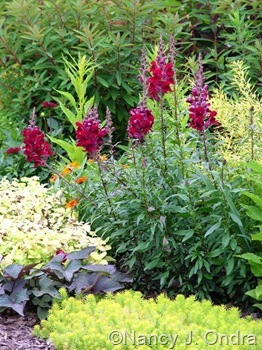 One other feature you’ll like about the ‘Black Prince’ snapdragon: it has dark foliage early and later in the season (green during the heat of summer). Ciao Nan! Non vedo l’ora di ammirare anche i post con gli altri colori, mamma mia che meraviglia!! Leggere i tuoi post mi lascia sempre a bocca aperta, sono molto istruttivi, soprattutto per l’importanza che dai ai fogliami. Penstemon eatonii, Penstemon cardinalis, Penstemon rostriflorus, Penstemon subulatus. Wonderful! Cheerful! For a display garden of hardy roses at one of our local historic buildings, we need a truly red hardy rose (hardy as in Zone 5b at best). So many roses listed as “red” are actually magenta. We’re looking for Christmas, American flag, stop sign, fire engine RED, not pink on steroids. Any suggestions? And by the way, we need a true red peony as well. Ideas, anyone? Hmmm…I get what you’re saying about the RED roses; I’ll have to think about that one. 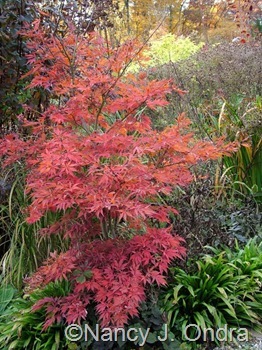 To my eye, Paeonia tenuifolia is a true red, but I could be wrong.